Events in the year 1825 in Brazil. The Armed Forces of the Empire of Brazil were the overall unified military forces of the Empire of Brazil. The Brazilian military was first formed by Emperor Dom Pedro I to defend the new nation against the Portuguese in the Brazilian War of Independence. The Army and Armada (as the Navy was called) were commissioned in 1822 with the objective of defeating and expelling the Portuguese troops from Brazilian soil. From the time of its inception, the military played a decisive role in the history of the Empire of Brazil. A sense of national unity and identity was forged out of the victorious Paraguayan War. The Emperor was commander-in-chief of the military, with the Ministries of War and Navy as the main organs by which military policy was carried out. Aureliano de Sousa e Oliveira Coutinho, Viscount of Sepetiba (21 July 1800 – 25 September 1855) was a Brazilian politician, judge and monarchist during the period of the Empire of Brazil (1822–1889). He was the leader of the "Courtier Faction", a political faction composed of high-ranking palace servants and notable politicians who exercised a strong influence over Emperor Pedro II in his early years. The Cisplatine War, also known as the Argentine-Brazilian War, was an armed conflict over an area known as Banda Oriental or the "Eastern Bank" (roughly present-day Uruguay) in the 1820s between the United Provinces of the Río de la Plata and the Empire of Brazil in the aftermath of the United Provinces' independence from Spain. Diogo Antônio Feijó (10 August 1784 – 10 November 1843) was a Brazilian politician and catholic priest. He was the Regent of the Empire of Brazil from October 1835 to September 1837. Beside members of the Imperial family, he was the first to ever hold this position alone; the other was his appointed successor after his resignation, the Marquis of Olinda. Both were regents at the time Emperor Dom Pedro II was still a minor. The Economy of the Empire of Brazil was centered on export of raw materials when the country became independent in 1822. The domestic market was small, due to lack of credit and the almost complete self-sustainability of the cities, villages and farms that dedicated themselves to food production and cattle herding. During the first half of the 19th century, the Imperial Government invested heavily in the improvement of roads while retaining an excellent system of ports. The former facilitated better commercial exchange and communication between the country's distant regions; the latter did the same for foreign trade.The Brazilian economy was extremely diversified in the post-Independence period, but a great effort was required of the monarchical government to carry through the change from a purely colonial economic system based on slavery to a modern capitalist system. Until its end, the monarchy continued the notable economic growth that began with the arrival of Prince Regent Dom João in 1808. This was caused, in part, by the liberalism adopted by successive Government cabinets up to 1889 that favored the private initiative. The green field and the yellow rhombus from the previous imperial flag, though slightly modified in hue and shape, were preserved — the green represented the House of Braganza of Pedro I, the first Emperor of Brazil, while the yellow represented the House of Habsburg of his wife, Empress Maria Leopoldina. A blue circle with white five-pointed stars replaced the arms of the Empire of Brazil — its position in the flag reflects the sky over the city of Rio de Janeiro on November 15, 1889. The motto Ordem e Progresso is inspired by Auguste Comte's motto of positivism: "L'amour pour principe et l'ordre pour base; le progrès pour but" ("Love as a principle and order as the basis; progress as the goal").Each star corresponds to a Brazilian Federative Unit and, according to Brazilian Law, the flag must be updated in case of creation or extinction of a state. At the time the flag was first adopted in 1889, it held 21 stars. Then it received one more star in 1960 (representing the city-state of Guanabara), then another in 1968 (representing Acre), and finally four more stars in 1992 (representing Amapá, Roraima, Rondônia and Tocantins), totalling 27 stars in its current version. The Imperial Crown of Brazil (Portuguese: Coroa Imperial do Brasil), also known as the Crown of Dom Pedro II or as the Diamantine Crown (so called because all of its precious stones are diamonds), is the Crown manufactured for the second Brazilian Emperor, Pedro II. With the addition of this Crown to the Brazilian Imperial Regalia, use of the previous, simpler Crown of Pedro I was abandoned. The design of the Crown of Dom Pedro II also replaced the design of the older diadem in flag and coat of arms of the Brazilian Empire, thus making the new Crown the official imperial Crown of the State. The Crown of Dom Pedro I was simpler, having been quickly manufactured in 1822 for the Coronation of Brazil's first Emperor, just a few months after the declaration of the country's independence. When Brazil's second Emperor, Pedro II, was declared of age and preparations for his coronation began, the government saw the need to commission the manufacturing of a new crown. The Independence of Brazil comprised a series of political and military events that occurred in 1821–1824, most of which involved disputes between Brazil and Portugal regarding the call for independence presented by the Brazilian Empire. It is celebrated on 7 September, the anniversary of the date in 1822 that prince regent Dom Pedro declared Brazil's independence from the former United Kingdom of Portugal, Brazil and Algarves. Formal recognition came with a treaty three years later, signed by both the new Empire of Brazil and the Kingdom of Portugal in late 1825. Joaquim Xavier Curado, first and only baron with greatness and count of São João das Duas Barras (Pirenópolis, 2 of December 1746 - Rio de Janeiro, 15 of September 1830), was a Brazilian military and politician. Liberal Party is a name for political parties around the world. The meaning of liberal varies across the world, ranging from liberal conservatism on the right to social progressivism on the left. The Neutral Municipality (Portuguese: Município Neutro), more formally known in the imperial era as the Neutral Municipality of the Court (Município Neutro da Corte), in reference to the Imperial Court, was an administrative unit created in the Empire of Brazil, that existed in the territory corresponding to the current location of the municipality of Rio de Janeiro between August 12, 1834 (when it was proclaimed the Additional Act to the Constitution of 1824) and November 15, 1889, when was proclaimed the republic in Brazil. But it only officially ceased to exist with the promulgation of the 1891 Constitution. By the republican constitution, this administrative unit became the Federal District in 1891, whose political situation changed again when it became the state of Guanabara in 1960, and later, with the fusion of this with the state of Rio de Janeiro in 1975. Paulino José Soares de Sousa, the Viscount of Uruguai (4 October 1808 – 15 July 1866), was a congressman, a senator, a State Adviser and a skilful diplomat. Born in Paris, he distinguished himself during the 1850s when, as Minister of Foreign Affairs for Brazil, he organized the Brazilian Diplomatic Corps and structured the entire Brazilian policy of intervention in the River Plate against Juan Manuel de Rosas from Argentina, and Manuel Oribe from Uruguay. A cautious diplomat, he knew how to take advantage of favourable circumstances, excluding unilateral action by Brazil and acting only at the request of the constitutional governments in the region. Success also came from his part in Franco-English involvement. He took on the financial burden incurred by France in maintaining the government of Montevideo and in relation to England, took steps towards the abolition of the slave traffic, creating favourable conditions for involvement by Brazil and its allies. In Paris in 1855 he negotiated the issue of Brazilian borders with French Guiana, which resulted in the matter being finally resolved in 1900, by the Baron of Rio Branco. The Viscount died in Rio de Janeiro, aged 57. Pedro de Araújo Lima, Marquis of Olinda (22 December 1793 – 7 June 1870) was a politician and monarchist of the Empire of Brazil. His long political career expanded through the reigns of João VI, Pedro I and Pedro II. He was also one of the founders of the Brazilian Conservative Party. He served as Regent of the Empire of Brazil from 1837 until 1840, during the minority of Emperor Pedro II. Later, during the personal reign of Pedro II, Olinda on four different periods served as President of the Council of Ministers. Politics of the Empire of Brazil took place in a framework of a quasi-federal parliamentary representative democratic monarchy, whereby the Emperor of Brazil was the head of state and nominally head of government although the President of the Council of Ministers was effectively the de facto head, and of a multi-party system. Executive power was exercised by the government. Legislative power was vested in both the government and the two chambers of the General Assembly (or Parliament). The Judiciary was independent of the Executive and the Legislative. The Empire of Brazil was divided into 20 provinces and the Neutral City, capital of the country. 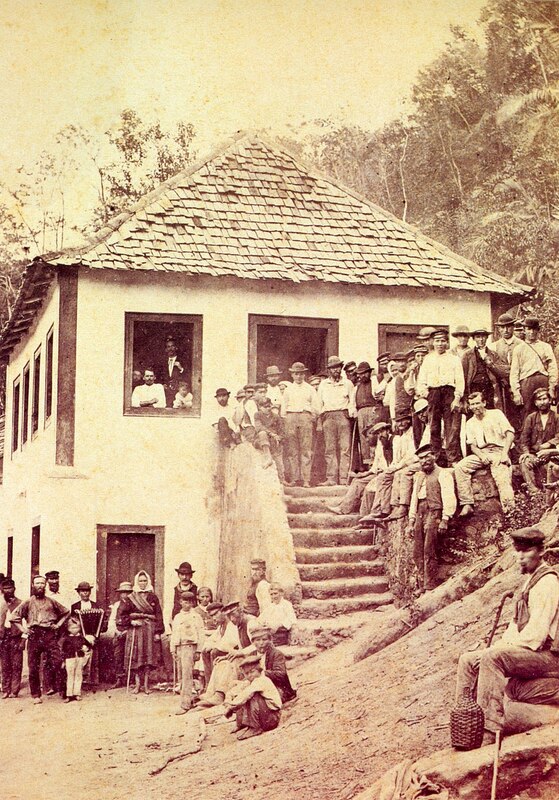 Historically, the political post of Prime Minister, officially called President of the Council of Ministers, existed in Brazil in two different periods: from 1847 to 1889 (during the Empire) and from 1961 to 1963 (under the Second Republic). The parliamentary system was first introduced in the country in 1847 by Emperor Pedro II and maintained until the abolition of the monarchy in 1889. The system was briefly restored during the tenure of President João Goulart between 1961 and 1963, after a constitutional amendment approved by his opponents before the beginning of his term created the post; it was abolished with a plebiscite. Below are more detailed descriptions of the post in each period. Prince of Brazil (Portuguese: Príncipe do Brasil) was the title held by the heir-apparent to the Kingdom of Portugal, from 1645 to 1815. Tied with the title of Prince of Brazil was the title Duke of Braganza and the various subsidiary titles of the Dukedom of Braganza. The title's name has its origins in the Viceroyalty of Brazil, a colony of the Portuguese Empire. The title was abandoned and changed to that of Prince Royal in the wake of Brazil's elevation from the status of a colony to the rank of a Kingdom united with Portugal in the United Kingdom of Portugal, Brazil and the Algarves. Brazil would later break from the United Kingdom and become the independent Empire of Brazil. The heirs presumptive of Brazil were known as The Prince Imperial of Brazil or The Princess Imperial of Brazil, with the style of Imperial Highness. Other members of the Brazilian Imperial Family were known by the title of Prince or Princess prefixed to their given names, with the style of Highness. The Portuguese title of Prince of Brazil, that existed as a title of the Portuguese heir apparent only while Brazil was still a colony of Portugal, should therefore not be confused with the later ranks of Brazilian Prince or Brazilian Princess, that stem from the era of the Empire of Brazil. The provinces of Brazil were the primary subdivisions of the country during the period of the Empire of Brazil (1822 - 1889). On February 28, 1821, provinces were established in the Kingdom of Brazil (then still part of the United Kingdom of Portugal, Brazil and the Algarves) superseding the captaincies that were in place at the time.